﻿﻿﻿Ahoy matey’s! A few weeks ago, some of our team members participated in the annual “Anything That Floats Race” which benefits Pirates Charities. 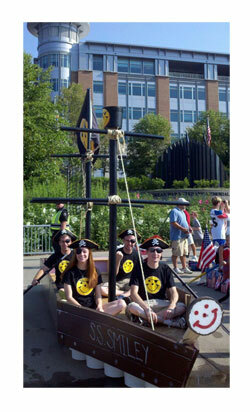 This year, team S.S. Smiley and its crew of Pirates set sail down the Allegheny River…AND WON FIRST PLACE! That’s right folks, for the first time ever, we won the race! Thanks to everyone who cheered us on to victory – we’ll see you next year! ARRRGH!